Sea otter nursing its young. Photo via Wikimedia Commons/Flickr. Sept 23-28 marks the 10th Anniversary of Sea Otter Awareness Week, a time when we recognize and appreciate the critical role sea otters play in the nearshore ecosystem. Sea otter spotted on Natural Habitat Adventures Ultimate Alaska Safari. Photo by Eric Rock. Sea otters are near and dear to our hearts because we frequently run into them on our Alaska tours. We hope bring awareness to the threats to these lovable marine mammals with 5 Sea Otter Facts you can share with your friends! After you’re done brushing up on your sea otter facts, enter our Wildlife Trivia Giveaway for the chance to win a Patagonia rain jacket! 5. Similar to polar bears in the Arctic, sea otters are a crucial species in their ecosystems, meaning their existence helps keep the ecosystem in order. For example, sea otters eat sea urchins, and sea urchins feast on kelp. When the sea urchin populations are kept in check by sea otters, kelp forests can collapse, which in turn causes the collapse of several other species. 4. You can often spot sea otters holding hands (or should we say paws?) while they take naps, to avoid drifting apart. How smart is that? 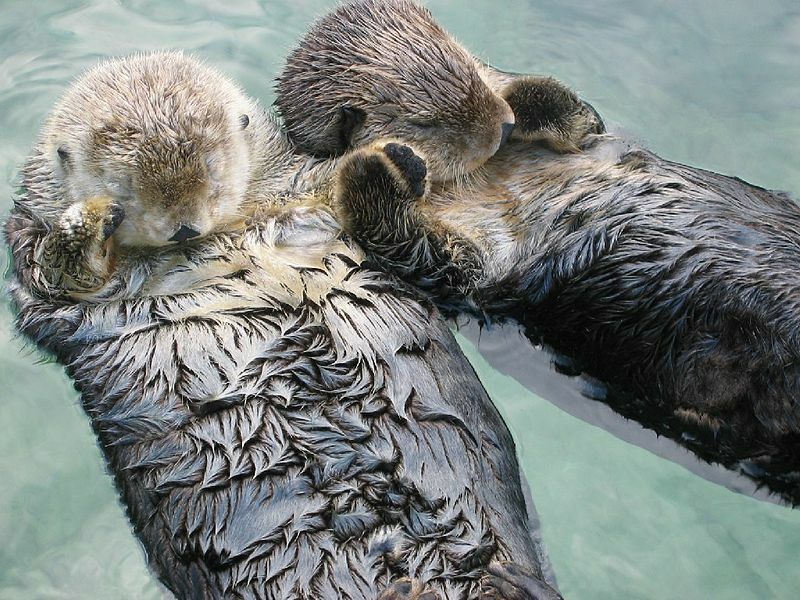 Sea otters holding hands. Photo via Wikimedia Commons/Flickr. 3. Sea otters are the only marine mammals that hunt with their front paws instead of their mouth. When they can’t get a shell open with their paws or teeth, they’ve been known to use rocks as tools. 2. At the height of the fur trade, sea otters’ numbers decreased from over 300,000 to only 2,000 worldwide. With the introduction of the Endangered Species Act & Marine Mammal Protection Act in the 20th century, their numbers have rebounded to almost 100,000 throughout California, Washington, Alaska, Canada, Russia, and even Japan, although they are still classified “endangered” by the IUCN. 1. Sea otters have the thickest fur of any animal on earth, an estimated 1 million hairs per square inch, because they don’t have blubber to keep them warm like other marine mammals. To give you an idea of just how dense their fur is, the average human head only has 700 hairs per square inch! How can you help sea otters? Promote their protection and see them in person by supporting ecotourism in their natural habitat – join one of our Alaska adventures! 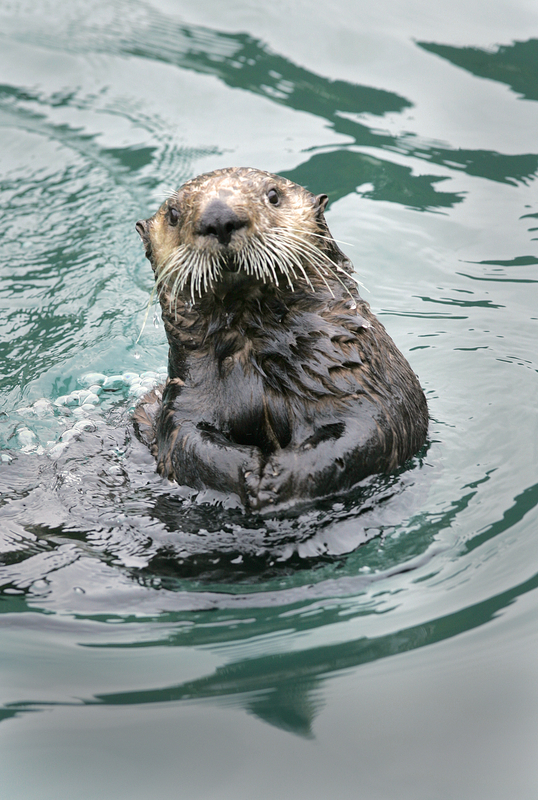 Now that you’re a sea otter expert, test your Sea Otter IQ by entering our trivia contest. Answer correctly and you could be the proud winner of an Patagonia rain jacket, valued at $179!